It started with as a little art project with one Visionary Artist, Lisa Scholder; one Dreamer, Peggie D. Sherry; one unsuspecting Videographer/Director, Jim Webb and one Brave Cancer Survivor, Wanda Maginues. Four years and 30 cancer survivors later this little art project grew legs and ran. Today we have a collection of art works that mesmerize, evoke deep emotions, celebrates life and leaves the viewer breathless. The common misunderstanding is that these are paintings, when in fact they are photos of women (and one man) who have allowed their scarred bodies to be a blank canvas for Lisa to transform with simple body paints. What we had no way of comprehending, when the project started, was the transformation of the survivor’s self-image from the beginning of the process to the end. All remarked on how beautiful they viewed their battered and scarred bodies and how they felt empowered by being transformed by paint. 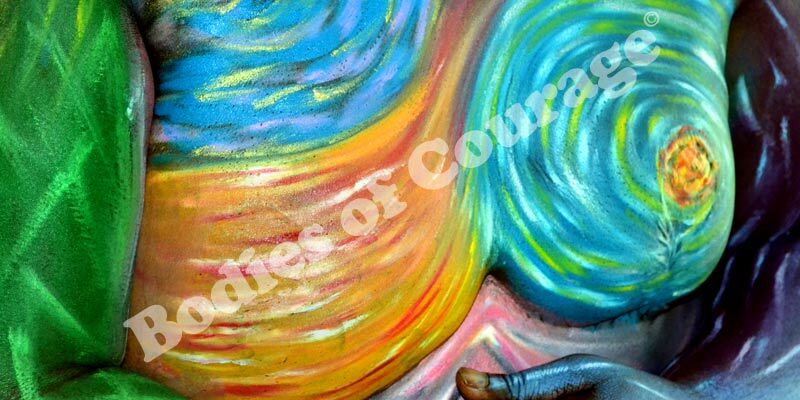 A few of the participants in the Bodies of Courage project have sadly lost their battle with cancer but the artwork and their interviews will live on for generations of people to marvel at. Not bad for a little art project.